Details: Ulrike Ottinger in Asia is a series of prominent films of Asian influence by a leader in German avant-garde film, Ulrike Ottinger. Co-presented by Inside Out, MUFF Society & Reel Asian Film Festival, these outstanding and thought-provoking films, Joanna D’arc of Mongolia (1989), Exile Shanghai (1997) and Under Snow (2011), follow women in Mongolia, exiles in Shanghai, and Kabuki artists in Japan, respectively. March 1, 6:30pm – In Echigo, Japan, snow piles up meters-high and blankets the countryside and villages well into the month of May. The people have developed customs for their unusual daily life. Time follows a different rhythm: children build fanciful snow castles in which they cook and sing, the women weave crepe in colourful patterns. 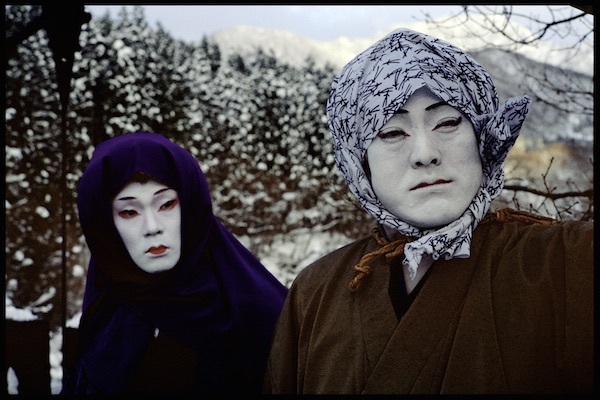 In order to record their very distinctive forms of everyday life, their festivals and religious rituals, Ulrike Ottinger journeyed to the mythical snow country – accompanied by two Kabuki performers. March 6, 6:30pm – Six life stories of German, Austrian and Russian Jews intersect in exile in Shanghai. This powerful documentary traces their lives through narratives, photographs, documents and new images of one of Asia’s biggest metropolises. With their numerous contradictory conflicting histories and populations, this film depicts a startling new account of a historic exile. March 8, 6:30pm – Winner of multiple awards, and a recent special screening at the MoMA, this strikingly original film follows a group of Western women who are taken hostage by the exotic, fierce Mongolian princess Ulan Iga. While the harshness of the Mongolian high desert is initially a trial for the pampered women, they ultimately adapt to these unfamiliar yet exhilarating experiences. March 1, 9pm – Ulrike Ottinger’s career begins with her creative roots in her home town on Lake Constance at the German-Swiss-Austrian border. Describing key moments in her life, including the impact of student protests in Paris and her move from painting to filmmaking, Brigitte Kramer traces Ottinger’s artistic development. Through interviews and film excerpts, this intimate personal close-up portrays one of the most important voices in German film.